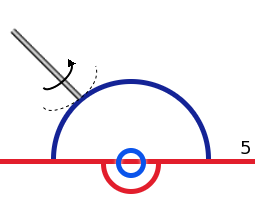 When your team is serving more than 1 penalty, the rules require that at least 1 skater remain outside of your defending zone restricted area. 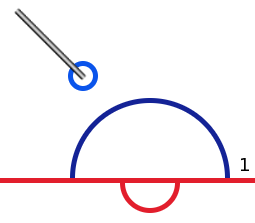 However, when you are in your attacking zone, attempting to score a goal - you may have all 3 skaters enter that zone. The four-in call often leads to confusion on the ice. This is because the rules do not require that play be stopped when four-in occurs until the team with four-in gains control of the ring. If the team in control of the ring skates four-in, make the call immediately. Otherwise, raise a bent arm to signal a delayed violation. If the 4th player leaves the zone before their team gains control - begin a five second count. If the ring leaves the zone before the team gains control - no call will be made. If the team gains control in the zone within the five second count - make the call. If the team gains control while there are still four-in, a delayed penalty should be called. Next time, before you start yelling four-in: check the signal being given by the On-ice Official nearest the freeplay line. 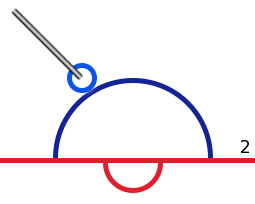 Only the goalkeeper or the acting goalkeeper (AGK) may legally play any ring that is on the goal crease line or entirely inside the goal crease. 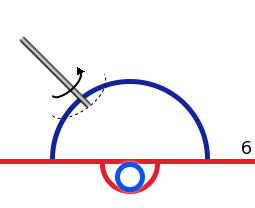 Alternately, neither the goalkeeper nor the AGK may move a ring into or onto the goal crease when it is entirely outside of the goal crease. If either of these rules are broken, play is stopped and the ring is given to the non-offending team. 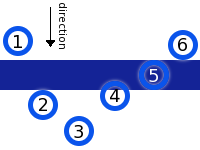 In the above image rings 1-5 may only be played by the goalkeeper. 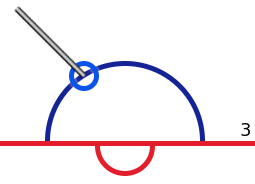 Rings 6 and 7 may be played by any player, but the goalkeeper may not bring the ring inside the crease. Play the ring! Sticks down! 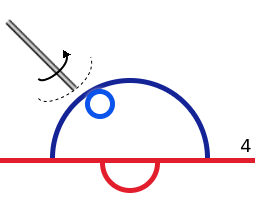 When an On-Ice Official is yelling "Play the ring" or "Sticks down" it is usually because there is an infraction occurring that is illegal, but has not yet caused a material change in advantage - and therefore there is no penalty to be called yet. (see The First Principle of Officiating). Often this is due to using your body or stick to interfere on a play, or due to over enthusiastic checking that is getting too high - up near the hands, etc. When you hear an Official calling these phrases out, consider what you're doing and pull back if you think you're at fault. If a material change of advantage does occur - you're likely to get a penalty. "The purpose of the playing rules is to penalize a player who, by reason of an illegal act, has placed an opponent at a disadvantage." This principle is the fundamental rule of Officiating. Every penalty decision made by an an On-Ice-Official (whether to call, or not to call) is judged on whether there has been both: an illegal infraction as per the rule book, and a material change in advantage to one team. The purpose of this principle is to ensure that the game progresses smoothly and so that it is not unnecessarily interrupted by the official's whistle.